At Acorn Carpentry and Joinery, we handcraft the highest quality bespoke hardwood front doors. Each door is made to measure and traditionally built from solid hardwood – the most beautiful, natural and long-lasting material for a front door. Whether you want your new front door to exude traditional simplicity or make a grand statement, our skilled joiners have the expertise to create a uniquely inviting and impressive entrance to your home. 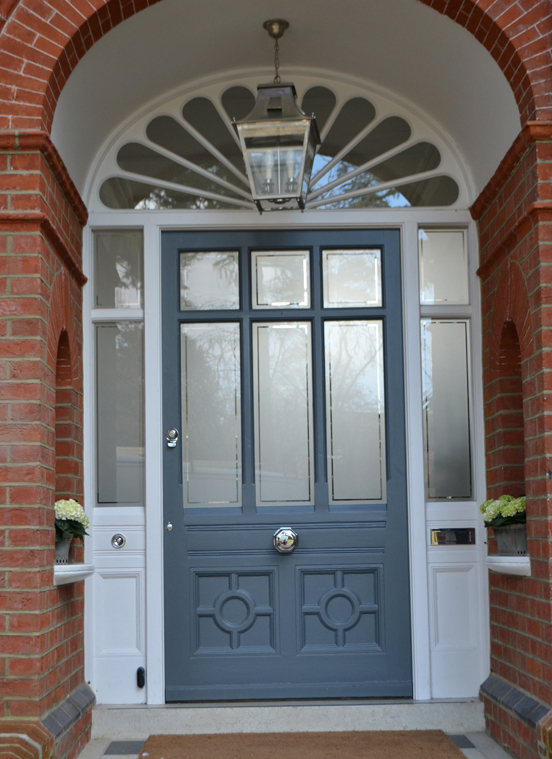 All our bespoke front doors are crafted to order in our local Surrey workshop and finished and fitted by our own team. 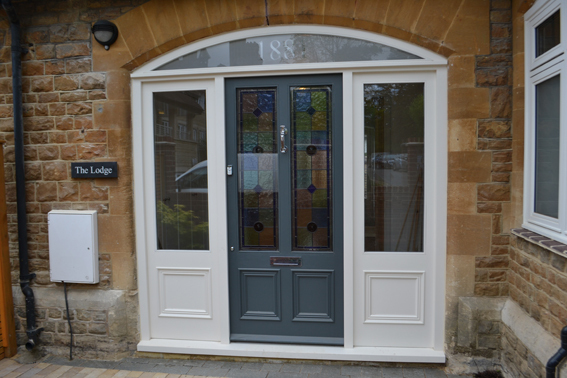 With our fully bespoke service you can specify every element of your front door – the paint colour, door furniture, glass design and more. We only use FSC certified hardwood from replanted forests so you can be sure the wood is good. 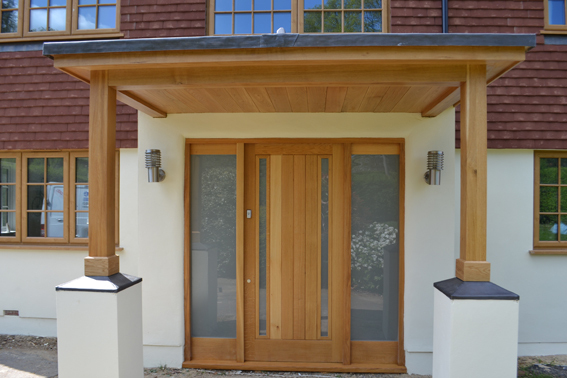 European oak is our favourite timber for front doors. Renowned for its incredible strength and durability, an oak door will stand the test of time and give your home the look of quality it deserves. There all kinds of finishes available for your real hardwood door, from rich opaque paints to light glazes that enhance the grain of the wood. For a natural look you could choose an oil or wax treatment – leading brand Osmo offers unsurpassed protection. While Sikkens is a favoured range for exterior wood coatings in stains, tints and strong colours. In our purpose-built spray shop we ensure every millimetre of the front door and frame is covered and we finish off our hand painted doors off with a brush, so you can touch up any scuffs as time goes by. 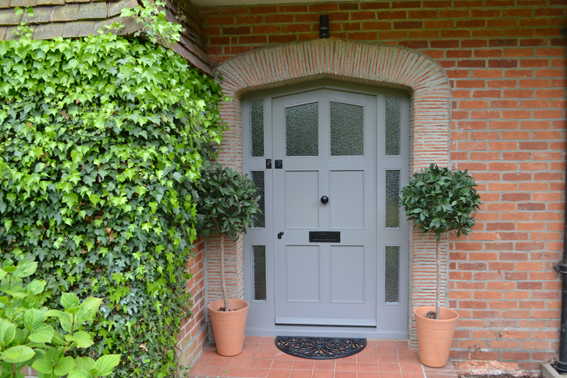 If you have a period property, our handmade wooden entrance doors can recreate the authentic character of any era, from classic Georgian panelling to elegant Edwardian or charming 1930’s vintage style. A modern minimalist look featuring sleek vertical panels or striking horizontal boards can look striking on many homes. Or we can create a completely original design custom-built to meet your style and needs. Your front door can be made with glazed panels, allowing light to flow into the hallway or lobby. As well as clear glass, we supply and fit decorative glass, patterned and frosted glass for privacy and toughened glass for increased security. Your entrance door is the first thing you see on your way in and the last thing you touch on your way out; and, importantly, it needs to keep your home and household warm and safe. Acorn real wood front doors are handmade in the time-honoured traditional way for strength, include the latest weather proofing and are secured using the best looking ironmongery. We make door frames in every possible shape and design, including those with top and sidelights. We can supply all the joinery as a ‘door set’, with the option to have your door pre-hung, or ready for hanging. A beautifully designed and constructed porch adds character and value to a property and provides a welcoming entrance to your home. Whether you’re looking for a simple single-pitch shelter or a fully glazed and enclosed structure, we can create a bespoke porch to complement your period or modern property. Please contact us for a guide price and initial design consultation, completely free of charge. and other areas in Surrey and Sussex.